When Ali Brooks moves in with me, she’ll need a car to go back and forth to Somerset to see family. She was going to bring hers up to London, but her ex needs transport too, he’s going to keep the car and so Ali will need to get herself sorted. My RX-8 R3 is hideously expensive to run, so it makes sense on longer trips for me to use less fuel for the same speed/distance as well. Having already spent a day thrashing an MX-5 around Brands Hatch a couple of years ago, I already had a soft spot for the model. 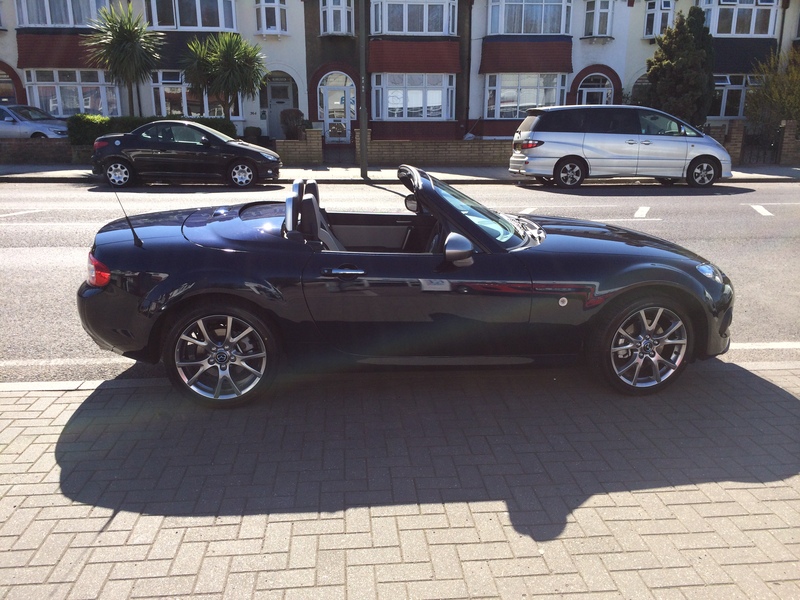 So that’s what we used as an excuse this weekend when we rode out to Masters Mazda at Beckenham to test drive an MX-5. 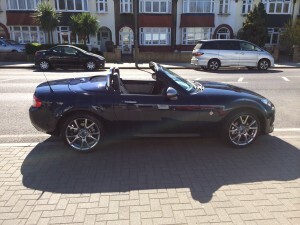 It turned out that they had the precise model we were after – a Deep Crystal Blue 2.0 litre MX-5 Sport Venture in the Roadster model (a retractable hard-top) – ready for us. Ali wasn’t keen on driving an unfamiliar car in front of someone else, so the sales guy drove her for a spin which she loved. I declined the offer of a test drive (knowing what it was like anyway) and as Ali loved the car, we went inside and did a deal for one. After I’d paid the deposit to secure a new one, we were allowed to take the car out ourselves: me first and then Ali brought it back in. We both loved the immediate response from the 2.0 litre engine as well as how quiet the car is with the roof and windows down, so we were chuffed with our choice.